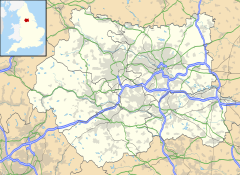 Worth Valley is a ward in the City of Bradford Metropolitan District Council, West Yorkshire. The population of the ward taken at the 2011 Census was 14,387. It is named after the River Worth that runs through the valley to the town of Keighley where it joins the River Aire In the north it is bounded by North Yorkshire, in the west by Lancashire and in the south by Calderdale District. It contains the Keighley villages of Oakworth, Oldfield, Haworth, Cross Roads, Oxenhope and Stanbury; areas of farmland; and large expanses of moorland. Its attractive villages, particularly Haworth and its Pennine landscape are at the heart of Brontë Country and attract many visitors. The Worth Valley has the Keighley and Worth Valley heritage railway running through it from Keighley to Oxenhope and has been used in several films, including The Railway Children, Yanks, the film of the Pink Floyd musical The Wall and an episode of the long-running situation comedy, The Last of the Summer Wine. Worth Valley ward is represented on Bradford Council by three Conservative councillors, Glen Miller, Rebecca Poulsen and Russell Brown. indicates seat up for re-election. indicates a by-election. The following people were born in the Worth Valley, have lived there in the past or are currently resident in the valley. ^ "Your councillors by ward". bradford.moderngov.co.uk. City of Bradford Metropolitan District Council. Retrieved 28 September 2017. ^ Redhead, Jonathan (13 October 2010). "MP Kris Hopkins resigns from Bradford Council". Telegraph and Argus. Retrieved 28 September 2017. This page was last edited on 18 May 2018, at 15:06 (UTC).